Picture this: You’re walking home after a long day of work, as the rain begins to fall from above. The wind starts to whip up the leaves beneath your feet, and the cold has started setting in, causing you to shiver. Your music player is out of reach and only has 5% power. Regardless, it’s too wet to take it out anyway. You’re completely exposed, except for the raincoat providing a welcome barrier between you and the elements. Luckily for you, this isn’t a typical raincoat: it’s the latest in the range from Zhong Lin Wang and colleagues from Georgia Institute of Technology, Chinese Academy of Sciences, and National Chung Hsing University. Your raincoat, unlike any other, has the ability to generate energy from the rain, wind, and body movement, and has touch sensors that can be used to remotely control your music player. 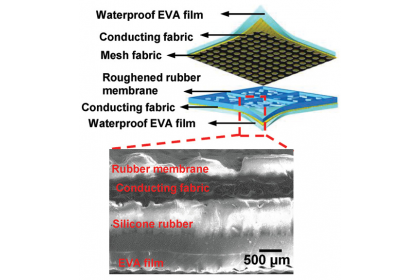 At least that’s the dream of Prof. Wang and colleagues, who, for the first time, have developed a fabric that is capable of harvesting energy from both natural sources (wind and rain) and mechanical motions (body movement). Using triboelectric nanogenerators (TENGs)—devices that can convert mechanical energy, such as body motion, into electricity—the researchers developed a soft and elastic multilayer fabric that turns gentle impacts into electricity. 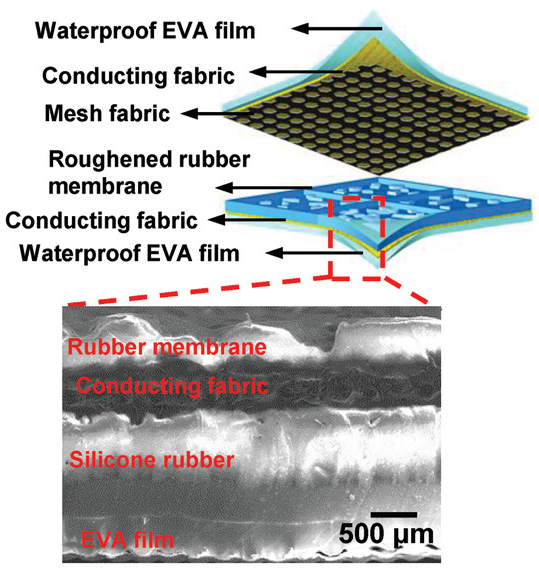 The TENG fabric is composed of different layers of conducting fabric (silver fibers and lyocell rayon), a waterproof encapsulation layer (ethylene–vinyl acetate (EVA) film), a triboelectrically charged layer (roughened rubber membrane), and a mesh fabric separating layer (see figure). Under external impacts, the air in the interspaces of the fabric moves, causing the top conducting fabric to contact the bottom rubber membrane. This dynamic movement creates an electric potential between the layers, which in turn induces an electricity output. The produced electricity can then be stored in a portable energy-storage device, or, theoretically, used to charge your music player. Manually applying pressure to the fabric is another way to unite the two layers. By forming the TENG fabric into a keypad (e.g., “play” and “next” keys), integrating it onto wearable fabric, and connecting it up to a data-processing microcontroller and a wireless transmitter, a music player could be remotely controlled. Using this method, the electronic device can be used from the safety of your pocket, without being exposed to the elements. The researchers envisage that this technology could not only address the issue of portable, wearable energy generation, but could also address larger scale issues, such as energy generation in remote locations where the environment does not lend itself to more typical means of sustainable energy production, such as solar energy or hydropower. To read more about this innovative and functional approach to energy generation, check out the open access article in Advanced Science and watch the informative supporting videos.